WASHINGTON (Aug. 17, 2015) -- Soldiers will no longer be promoted without first having successfully completed related professional military education, or PME, courses, according to recently-signed Army Directive. Soldiers will need to complete their schooling before they are allowed their new stripes. "By linking structured self-development and the NCO Education System [NCOES] to subsequent promotion, we better prepare NCOs [noncommissioned officers] for the complexities of today's operational environment while reinforcing the benefits of a deliberate, continuous, sequential and progressive professional development strategy," wrote Army Secretary John M. McHugh in Army Directive 2015-31, which was released Aug. 13. Soldiers will no longer be promoted without first having successfully completed related professional military education courses, according to recently-signed Army Directive. Soldiers will need to complete their schooling before they are allowed their new stripes. 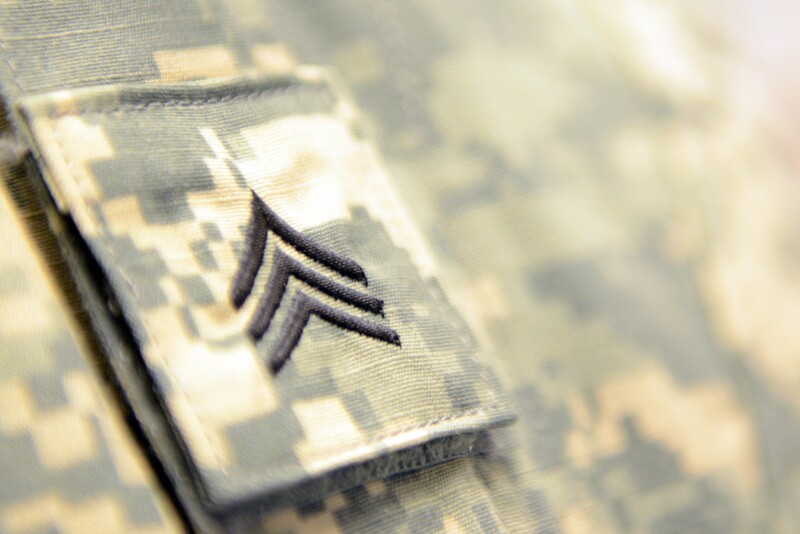 Beginning with the January 2016 promotion month, pinning on the sergeant will require that Soldiers have first completed the "Basic Leader Course", which was formally known as the "Warrior Leader Course." For Soldiers who want to pin on staff sergeant rank, they must first have completed the Advanced Leader Course. "Soldiers on the recommended list who are not graduates of the respective course will not be considered fully qualified for promotion pin-on regardless of their accumulated promotion points," the directive reads. "These Soldiers will remain on the recommended list in a promotable status, but they will not be selected for promotion pin-on until they become fully qualified by completing the required course and a promotion requirement exists." Soldiers expecting to pin on sergeant first class as a result of a fiscal year 2016 selection board must first complete the Senior Leader Course before pinning on their new rank. "Conditions are set so we can enforce a standard for Soldiers to complete professional military education - that is the NCOES platform - before promotion to the grade in which it was designed to support," said Gerald J. Purcell, personnel policy integrator within the Army G-1. Purcell said that a Soldier, who is otherwise qualified to be promoted from corporal or specialist to sergeant, will be on the promotion list. But when that Soldier's name is next to fill an Army promotion requirement, if that Soldier is found to have not completed PME - for a specialist seeking sergeant, this means Basic Leader Course - then the Soldier will be passed up for that promotion. "There will be a filter in place that takes their name off the list of fully-qualified names," Purcell said. "They will get skipped. Even if they have more promotion points, they will not be considered fully-qualified to pin the grade of sergeant on." The Soldier who is skipped for promotion due to a lack of PME still stays on the promotion list. But once that Soldier gets the PME, he or she doesn't automatically get stripes. Instead, the Soldier will have to wait for a future requirement. Since the 1980s, Purcell said, the Army has allowed "conditional promotions," where Soldiers could get their stripes without having had the corresponding professional military education. "We had NCOs walking around who weren't school-trained, with a follow-on requirement they complete the training or they were going to be reduced," he said. "Today, the leadership believes there is a capability to provide Soldiers an opportunity to go to training, complete the training, and consequently, have all of the fundamental training in place before they are asked to perform at the next higher grade." With the new PME requirement, a Soldier's stripes will not just be an indicator of rank or pay - it will be an indicator that the Soldier has been trained as a leader, Purcell said. "When you see a Soldier wearing a sergeant rank, you know that Soldier is going to have been trained formally through an education system to prepare him or her and give them tools to succeed at that grade," Purcell said. "So the Soldier is going to have all the tools in their kit bag to fully succeed at their grade." The new policy also similarly affects National Guard Soldiers where enlisted Soldiers on a promotion list whom have completed their structured self-development requirements will be selected and assigned to higher grade vacancies. Soldiers selected for higher grade vacancies without the NCOES requirement will have 24 months to complete the level of NCOES required for promotion pin-on or will be removed from the position. Additionally, the directive makes changes to the retention control point for active-duty and Army Reserve Soldiers. According to the regulation, effective October 1, Soldiers selected for promotion to sergeant first class and master sergeant will not get an extended retention control point until they actually pin on their higher rank.